Nice and well furnished apartment with large south-facing balcony. Nice apartment with large balcony that extends along the entire apartment and with access from all rooms. The bedroom has two single beds and if you need more beds you have a sofa bed in the living room. Separate kitchen, fully equipped. Bathroom with shower and separate WC. And the apartment is of course equipped with wifi and air conditioning. On the balcony you have a small dinner table, a lounge sofa and plenty of sun light. The apartment is located in the neighborhoods north of the Marché Forville which you can reach in a few minutes.. If you pass the market, you will in about 10 minutes reach the Vieux Port and after a few more minutes you are on the beach. A walk to the Festival Palace takes approximately 10 minutes. If you come by car you have free parking on the streets nearby. 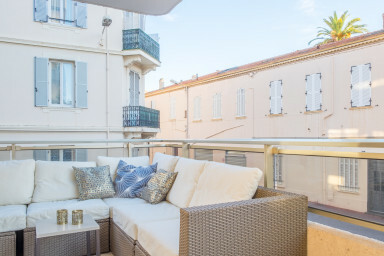 A great place to stay in an area close to the centre of Cannes but away from the immediate bustle. A very acceptable walk to and from the facilities and the luxury of a great balcony! Great apartment! Close to center of Cannes - very good condition and clean. Host went above and beyond to accommodate check out and check in. Free parking on a street - rarity in Cannes.